FAA Section 333 Exemption Granted. 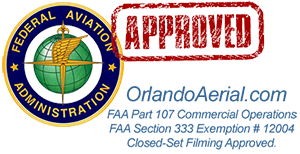 As of July 1st, Weldon & Associates, Inc. (dba OrlandoAerial.com) has received its official FAA Section 333 exemption (Exemption # 12004) along with a blanket COA (Certificate of Authorization) for commercial operations in the NAS (National Airspace System). As part of this exemption, we are now authorized to conduct commercial sUAS (Small Drone) operations within all 50 states to include its territories. OrlandoAerial.com is also specially authorized to conduct Motion Picture and Television Closed-set filming operation. Most FAA exemptions are not allowed this special provision, but OrlandoAerial.com has been awarded this under its exemption status. Our exemption request was filed in February 2015 with an approval date of July 1st, 2015 and expiration date of July 31st, 2017. If you would like more information about the services we can provide for your company or project, please contact Chris Weldon, Chief Pilot at 386-873-0020.